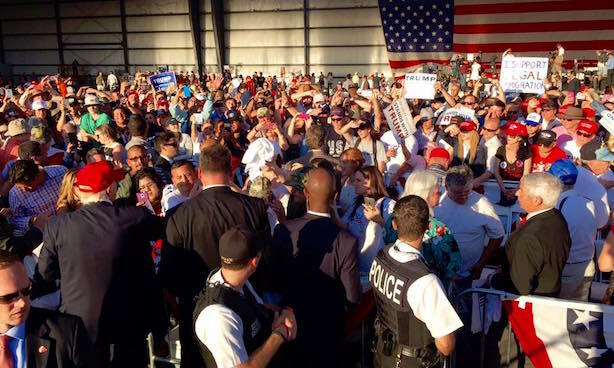 Look for May's jobs report this morning; Another Trump rally turns violent; Report: Twitter, Yahoo talked deal; Tribune rebrands; National Doughnut Day. The scene at a recent Trump rally in Sacramento, California. (Image via the Trump campaign's Facebook page). Analysts expect May’s jobs report to show about 180,000 positions were created last month, a slight drop from April and in line with a string of somewhat disappointing jobs reports this year. Experts expect the unemployment rate, a key election-year topic, to drop to 4.9%. Update: The unemployment rate fell to 4.7% despite the U.S. economy only adding 38,000 jobs last month. Donald Trump responded to Hillary Clinton’s biting indictment of his foreign policy ideas on Thursday night. However, the scene outside the rally turned slightly dangerous as protesters attacked a handful of Trump supporters. Trump’s security removed a journalist from Politico from the event. The presumptive Republican nominee’s statements to The Wall Street Journal earlier in the day that the judge in the Trump University case has a conflict of interest because of his Mexican-American heritage also drew criticism. Twitter and Yahoo held merger talks weeks ago, as Marissa Mayer continues to look for a buyer for her company. However, her counterpart at Twitter, Jack Dorsey, didn’t even show up for the meeting, according to the New York Post. Twitter exited the bidding process shortly thereafter, according to the newspaper. Tribune, the owner of the Los Angeles Times and the Chicago Tribune, is changing its name to Tronc, which is short for Tribune online content. Gannett, the publisher of USA Today, made a bid of $864 million for its fellow media company last month. The curious new brand was jeered by online media outlets. It’s National Doughnut Day — the Associated Press says the correct spelling is "doughnut," not "donut" — so expect activations from sugary brands. Last month, McDonald’s experimented with Facebook Live to positive results on National Hamburger Day.